Thanks to Bollywood, I have seen enough of Switzerland! But this piece is about Norway, not Switzerland. All my life, I was made to believe that Switzerland was the most scenic place on earth and that it had the most charming mountain-tops with beautiful railroads. But I have been wrong! If this such a thing as the ‘most beautiful place in the world’ then Switzerland isn’t the sole contender. Norway is even better, if not equal. But it seems like a challenging task to discuss ‘all things amazing’ about Norway as I wouldn’t know where to stop once I get started. Still, I should just try and wrap it into something short and quick. So my friends, this is Norway in a nutshell for you! First of all, I think, I owe at least a few words to this amazing place because it brought back the sense of euphoria I thought I had lost long ago. I knew Norway was beautiful but I didn’t know that it could enchant you like it did! 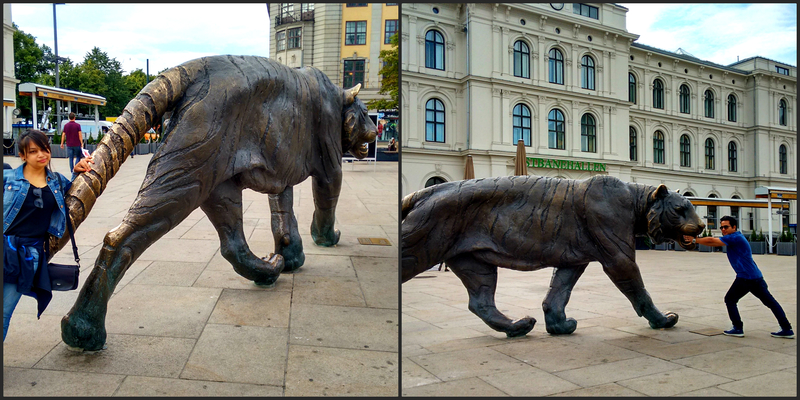 There could be two reasons why I was so surprised to see the wilder side of Norway. One, every travel article about Norway begins and ends with nothing but the fact that Norway is one of the most expensive countries in the world. Nobody talks about what it has to offer, and sometimes for free! Second, no photograph in the world can justify its unmatched beauty, simply laid out in front of a pair of naked human eyes! You have to see it to know it. Before this much-awaited trip, I was at a loss. The google maps were useless as they haven’t done much mapping in Norway, especially, in its remote areas yet and there wasn’t much information about the weather conditions as well. 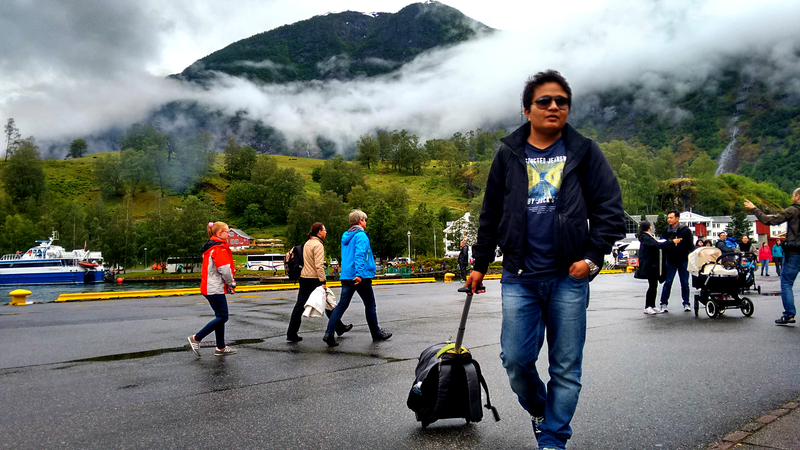 A a result, we ended up in Norway with inadequate clothing and too many misconceptions. The expense factor was there, of course. But having stayed in Finland for quite some time, we found the prices almost equal and that is why bearable. It is true that the prices in Norway are pretty steep but this post is not going to be about the expenses. What nobody tells you about Norway is, nature comes for free. Yes, you read me right! It’s free. So would you really mind paying for a modest apartment or a hotel room and getting unlimited and complimentary views from your window? And nobody dies of hunger in Norway. Like us, you can always stock up food from any supermarket. During our visit, once in a while, we indulged in modest dinners and luncheons at random restaurants. The rest of the meals were managed from the frugal stock we carried with us. Thanks to instant noodles, coffee pouches and supermarket snacks we survived Norway quite comfortably and are pretty much alive to share some details about our Norwegian adventures with you. To begin with, I was amused to read that it rains in Norway so much so that they had once installed umbrella vending machines all across Oslo. The idea failed for no particular reason, but I guess they already had enough umbrellas. And I thought only Germans were crazy enough to come up with such awesome ideas. I saw this water clock in a Berlin mall which was an amazing invention as you could actually see time flowing in drops. 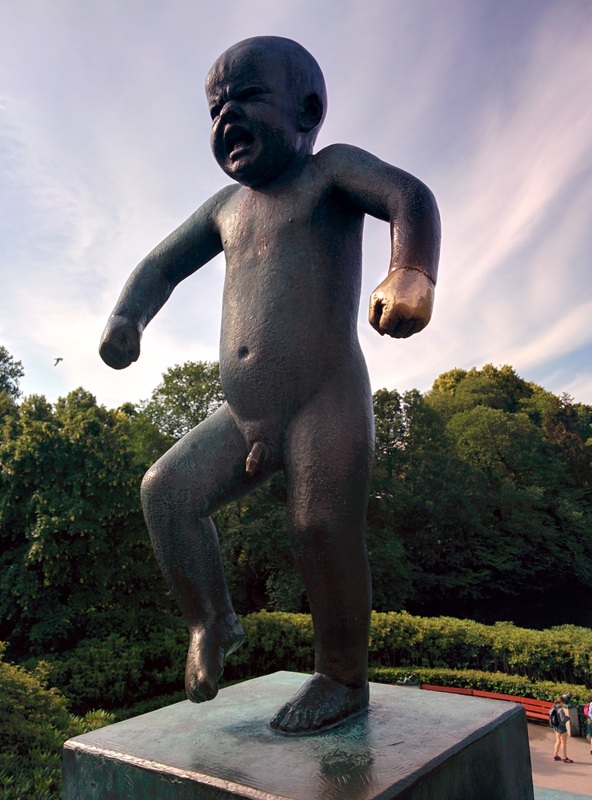 Oslo didn’t surprise us when it welcomed us with a gloomy sky that looked like a sulking child on the verge of tears. The heaven broke loose as soon as we entered our Air BnB apartment. Renting an apartment for a vacation is the most convenient thing to do while travelling on a budget. The price range is wide and you get to cook your own meals. But this is strictly not for those with a habit of being waited on. Since we don’t have such fancy habits, we were happy cooking our own meal and watching the rain drip down our windowpanes. 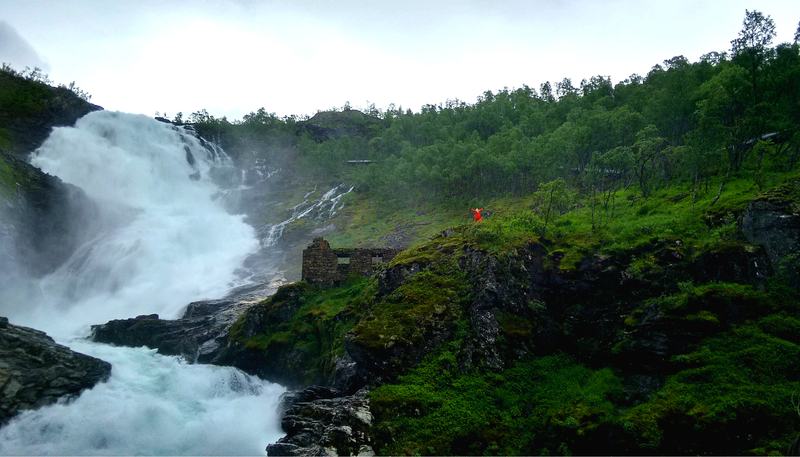 The same rain followed us next morning to the Oslo Central Station from where we were to take a train to Myrdal and eventually to Flåm. Forget having any knowledge about these places, we didn’t even know how to pronounce their respective names. Later, I found out, the ‘a’ here is pronounced as ‘o’. I was super excited because this was my first train ride in Europe and, soon, I began my series of ‘awws’ as the train made an exit from Oslo. Gradually, the concrete houses were replaced by wooden cottages and marsh-mellow like hay-rolls covered with white sheets. Verdant lakes and green hills rode along and I thought the best of Norway was already spread in front of my very own eyes. How wrong I was! The best was yet to come and my illusion broke only when the green mountains gave way to snowy mountains and glaciers. It came as a shock because nobody warned us about freezing cold spells in the summers. We froze in terror thinking of death caused by hypothermia as the train ran along vast stretches of frozen rivers and valleys. 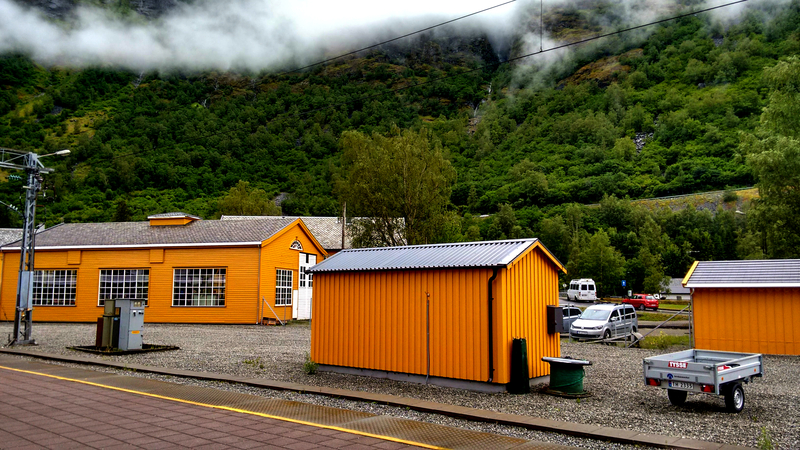 When the train finally stopped at Myrdal, a pretty little station in between snow-capped mountains, we had tired ourselves from all the excitement. The red train against the backdrop of white snow took me back to certain typical Bollywood movies where a scantily clad heroine and a heavily dressed hero break into a dance for no apparent reason. It doesn’t matter if it is at a crowded European train station (Switzerland most of the time) or a horribly frozen mountain, you will find them dancing to random Bollywood beats. Considering the fact that we we didn’t have adequate warm clothes, we almost felt like those Bollywood actors. If you haven’t seen such crazy stuff yet I urge you to do so. I bet, it is as good as seeing a unicorn. In fact, this could actually be the magic you needed in life! Bollywood movies are real stress busters. 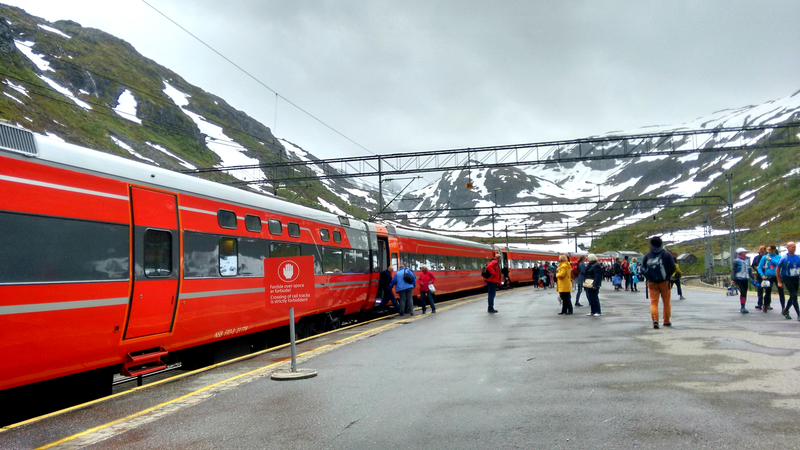 At Myrdal, there wasn’t much to do except for watching Japanese tourists clicking pictures and smiling at them. When the second train arrived I almost ran to grab a window seat. As much as I am ashamed of this act now I was feeling proud of my endeavour at that moment. I was about to ride on one of the world’s steepest railroads after all. But we were making a downhill journey. This one hour ride was probably the most amazing experience of my life as my jaw dropped when the train stopped by a colossal waterfall. My jaws dropped not because of its enormity but the surprise it had in store for us. Being a slave of smart phones, we were watching everything through our cameras. Suddenly sweet music filled the whole atmosphere and on my screen appeared a woman in a red robe dancing atop the fall. Perhaps, it was the weather that had this magical effect or it was the music, the whole setting was somewhat surreal. For a few moments, I was confused. The woman in her red robe along with the cottony clouds and milky white waterfall gave me the magic I had been looking for all my life. That very moment, I was no longer a part of this world! 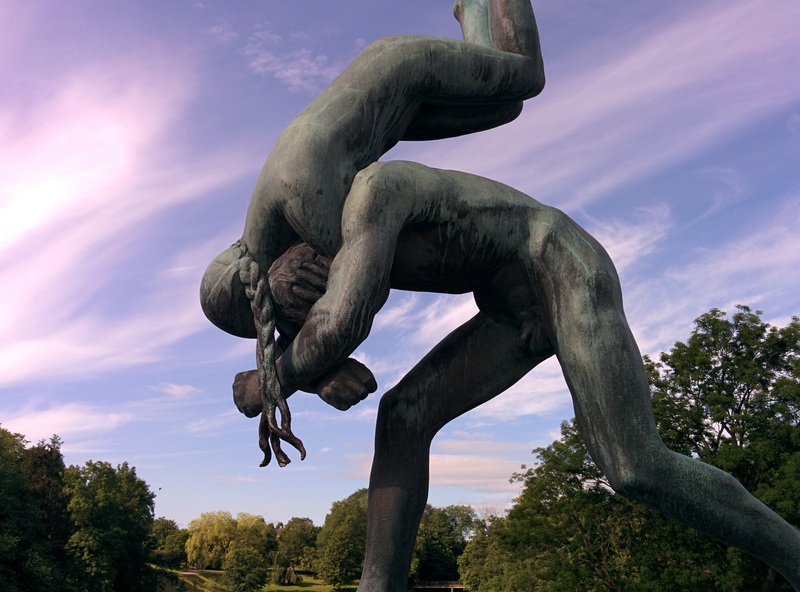 If you are wondering what it was all about we need to dig into some Scandinavian folktales. According to the legends, mysterious creatures (called Huldra or Hulder) roam around the mountains and enchant human beings with their sweet songs. They are more like forest fairies who protect friends of the forests and captivate the bad ones with their music. The story dates back to an unknown time in the past when there lived a woman with many children. One day God came to visit her and she wasn’t done with her housework yet. She hadn’t even cleaned some of her children. In panic, she hid the dirty children in a closet and presented the clean ones in front of God. Disappointed, God cursed the woman that the children she had hidden from him would be hidden from humanity forever. Thus, Huldras came to roam around the mountains always hiding and only appearing to those they want to harm or help. Watching the dancing woman I was tempted to jump into the fall and submit myself to captivity if all of this was only real. 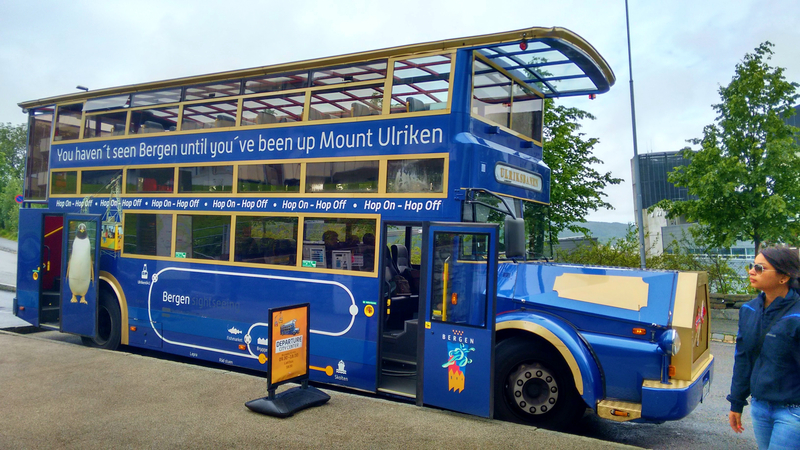 Kudos to Flam Railways for this tribute to the mountains and their legends. If verdant valleys, frozen rivers and gushing waterfalls weren’t enough, you gifted us the most amazing memory to cherish for the rest of our lives. 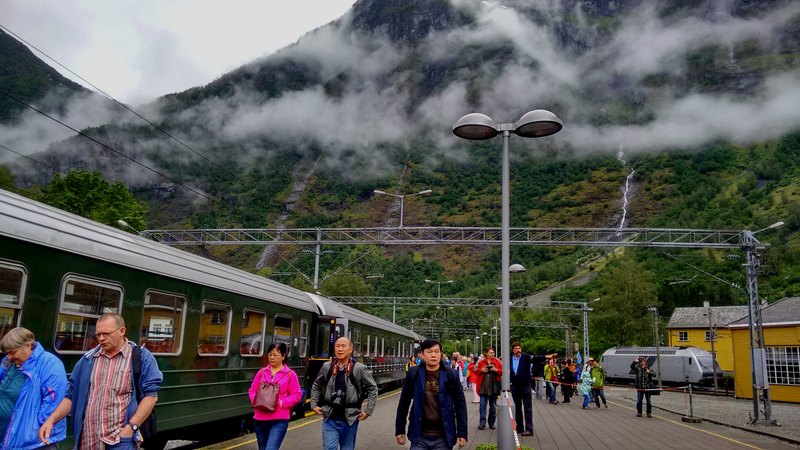 Compared to this surprise, the rest of the train ride was nothing but down at the valley awaited us the much talked about Norwegian fjords. And the clouds welcome you like this. Do dead people arrive in heaven like this? My husband is on a mission to make this bag travel the whole world. Just that the bag is borrowed from a friend. Flåm was a sleepy little village with extra cute red cottages including the train station. As we waited for our boat ride to Bergen, the second largest city in Norway, we lunched on fresh fish and chips; fish picked from the fjords and potatoes I don’t care where are they from as long as they are crispy. Sitting in silence at an unknown station and watching the thick clouds looming over our heads, we were finally able to grasp the reality. 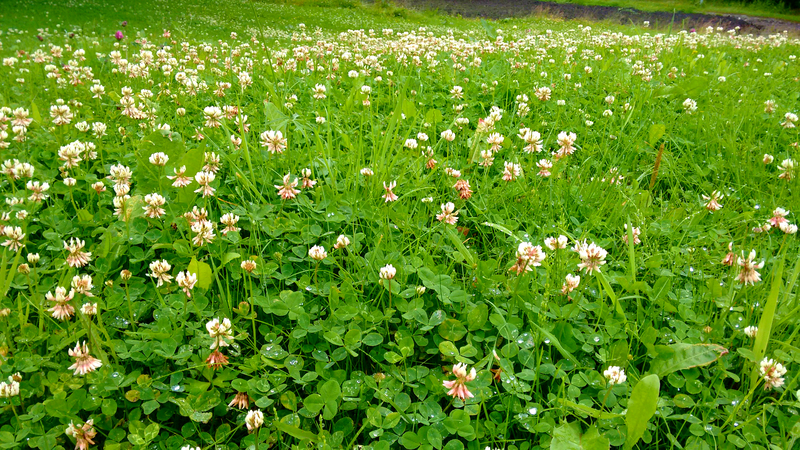 The weather was rainy and it gave a ‘Jurassic Park’ like feel. 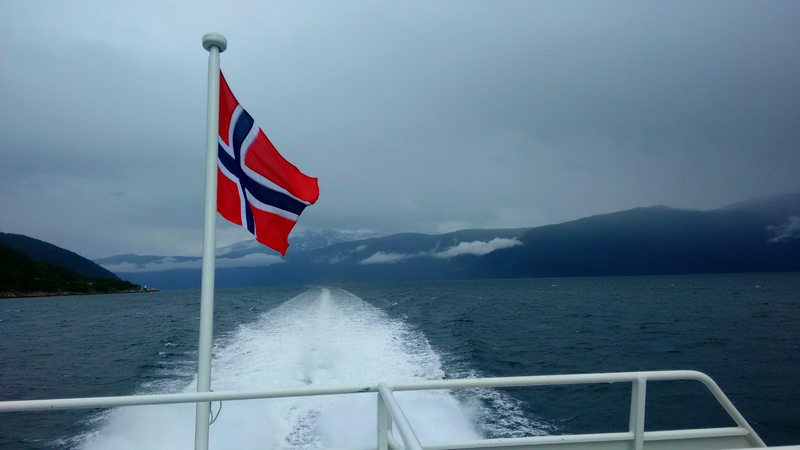 The fjords were fascinating yet intimidating at the same time. The greenery of the fjords was of the darkest shade and the water looked like a thick blanket ready to engulf our tiny existence. 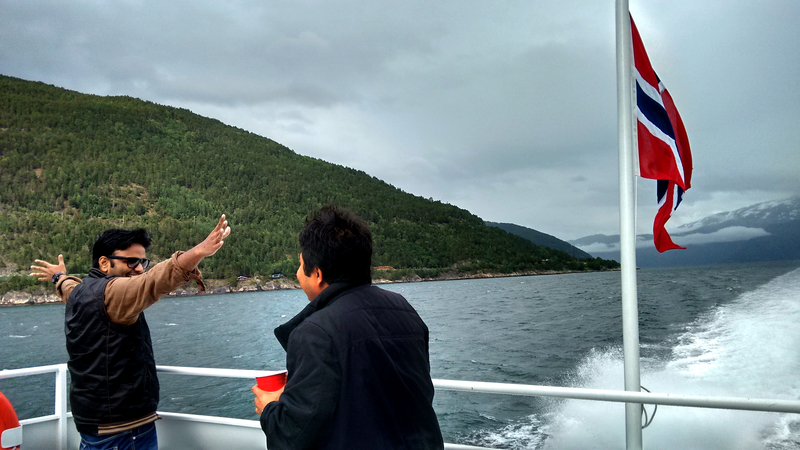 Interrupting the silence of Songenfjord, world’s deepest and longest fjord, we were inching towards heaven. After about five hours of hypnotic ferry ride when we were making an exit from this fjord, we were waved goodbye by a rainbow. The rainbow vanished within seconds but not before reminding us how lucky we were. Back home in India, we always associate rainbows with luck. Songenfjord, world’s deepest and longest fjord. Speaking of luck, the taxi driver in Bergen fooled us and we ended up paying about 30 euros for a walkable distance. To make things worse, we had a hard time finding our apartment but God bless that friendly man who helped us even when his pizza takeaway was getting cold in the Norwegian chill. Hope a Huldra would reward this man some day for being so helpful. Bergen, Oslo’s little sister/ Can there be anything prettier? Begren presented a contrasting sight as we were approaching the port. Tall buildings atop mountains looked unusual especially after seeing so many pretty little cottages on our way. 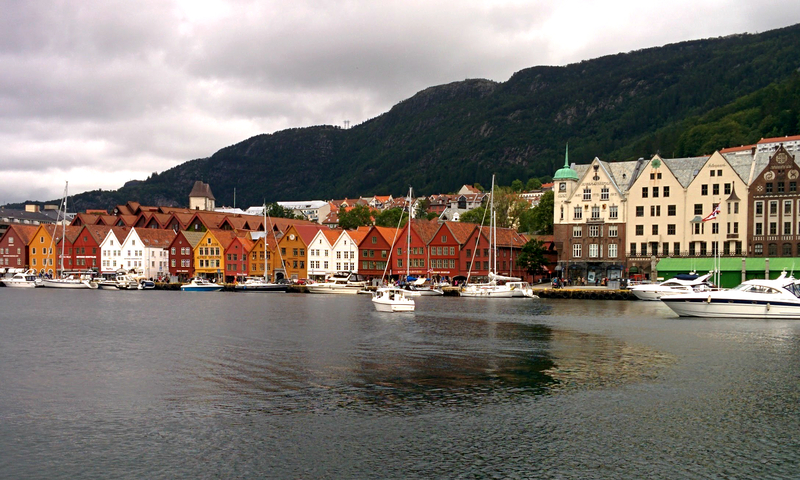 But being one of the most important cities in Norway, Bergen had to accommodate such contrasts. Despite all the modern buildings, one can never fail to spot a small stretch of yellow and red wooden cottages from a distance. 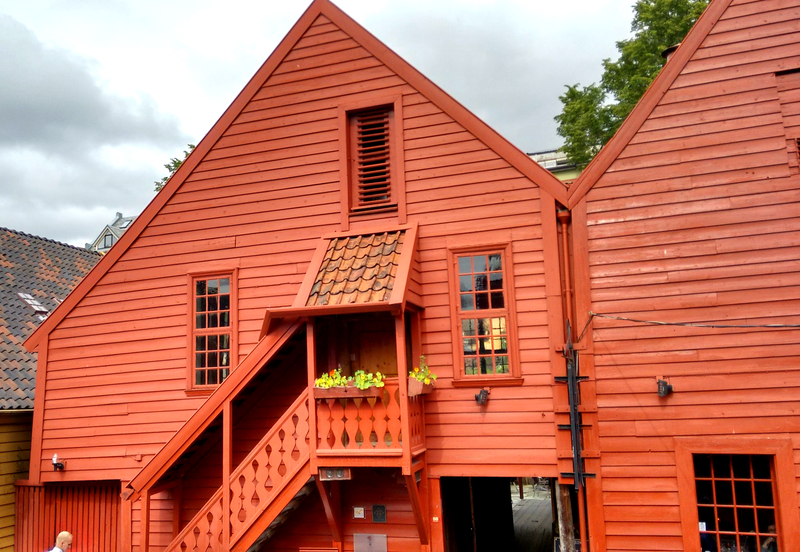 That is Bryggen, the old Bergen for you. Today, it is a UNESCO World Heritage site and the wooden cottages speak of life from the 11 the century. History has it as the one of the oldest trading ports in Northern Europe. Crazy tourists harassing a fish! 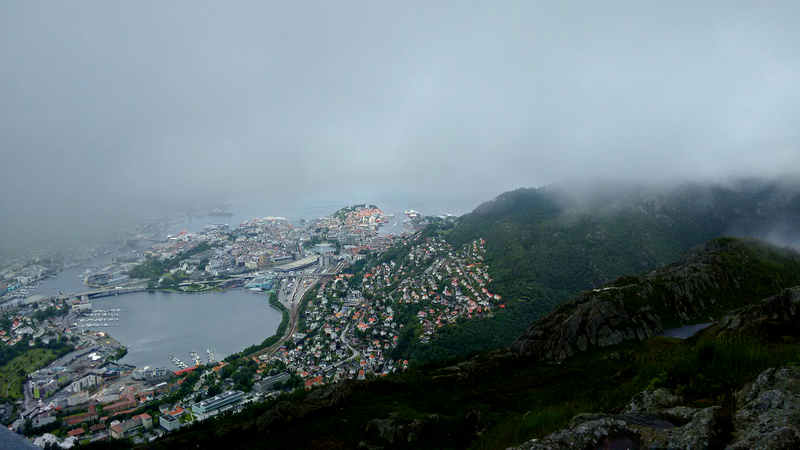 They say, when in Norway you got to visit Bergen and when in Bergen you got to hike to Mount Ulriken. 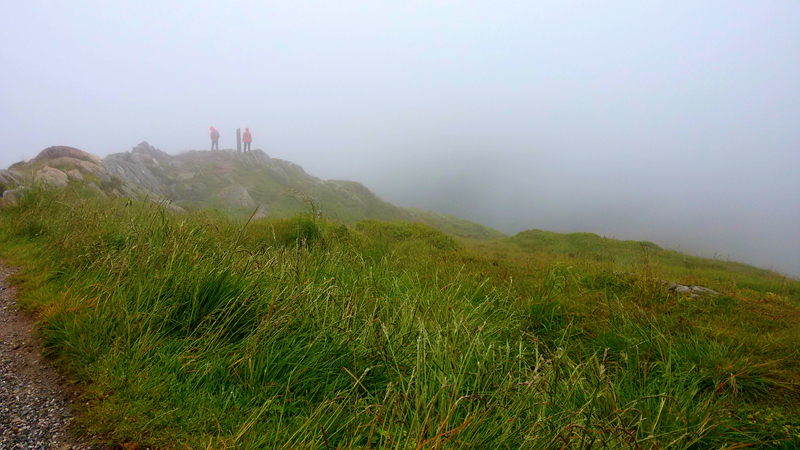 Short of time, we took the cable car to the mountain top, but I would have loved to hike. 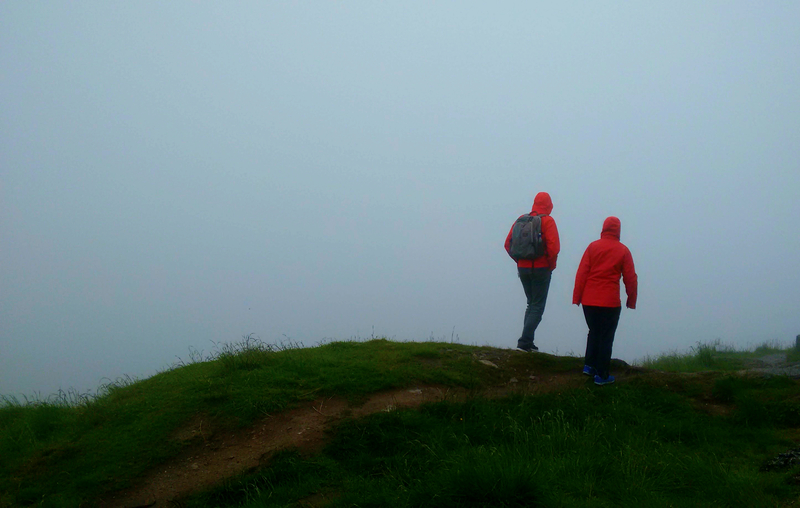 The weather was very bad and we didn’t see any view and almost froze to death at the top, but the whole feel is definitely worth a visit. Beyond these, Bergen stole my heart with its pretty houses, seafood stalls, and talented streets musicians except for the worst Indian meal I have ever had in my life. Karahi Paneer with coconut? Never heard of that before. For budget travelers, there are decent pizza places strewn all over the town. We binged on the largest pizza I have ever seen in my life just for about 16 Euros. Then again, size and price are relative matters. Simple advice- when in Bergen just try sea food. 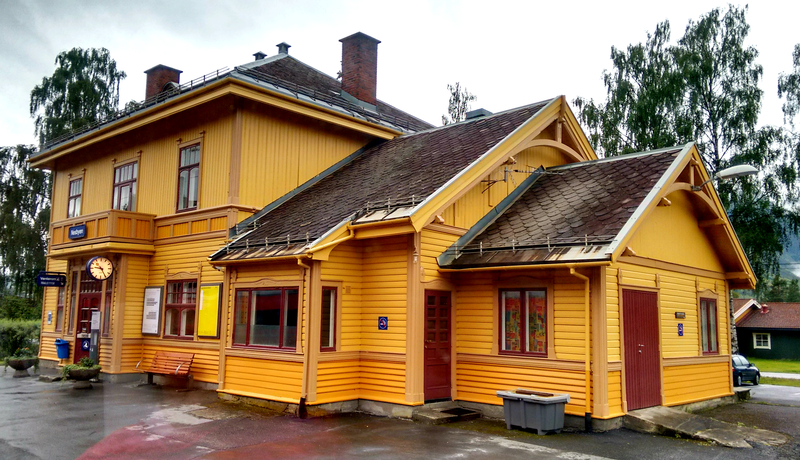 Thus, stuffed with Norwegian nature and pizza, we marched back to Oslo by an overnight train. 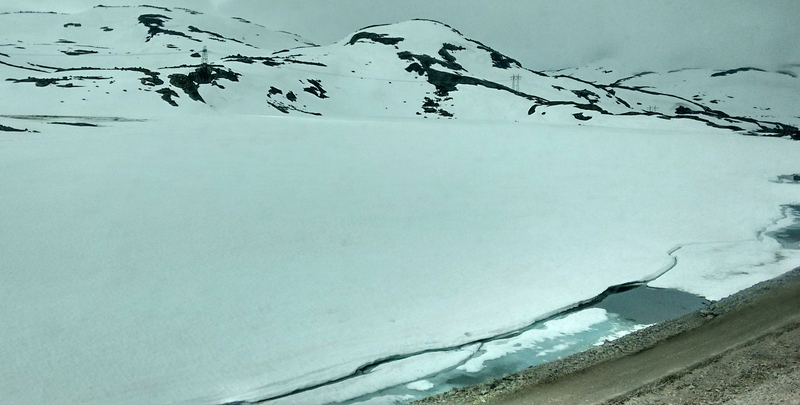 The train passes through glaciers and the whole sight looked eerie at night. I was convinced that the train would stop in the middle of nowhere and we would be under some zombie attack. Too much fiction I read! This whole journey was so amazing that I don’t feel like writing about Oslo anymore. I am still drunk on the wilderness. We were lucky to arrive in Oslo on a sunny day and regretted not bringing our shorts. Whereas, a day before we were cursing ourselves for not getting enough warm clothes. 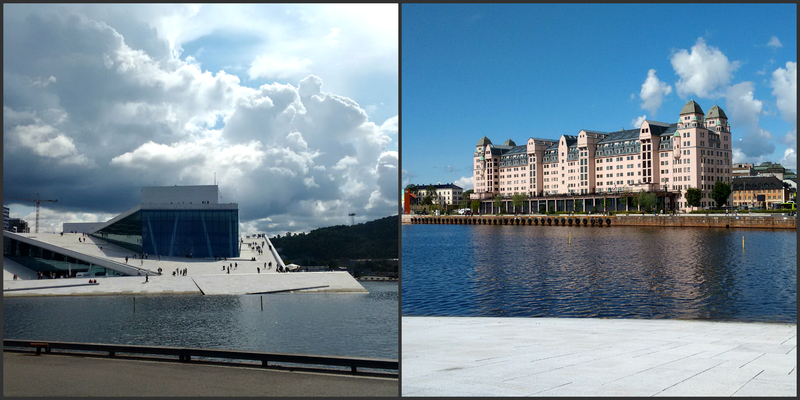 You see, Norway is all about contrasts. So when you finally make it there, tell me if it doesn’t drive you crazy, in a happy sense of the word. Have you been to Norway already? If yes, which parts of this fascinating country you have been to? I would love to go back to Norway again and explore more. Drop your suggestions in the comment section below.